CHARLOTTE, N.C. (AP) — Hornets coach James Borrego told Jeremy Lamb before the season that the starting spot at shooting guard was his — as long as he earned it. Lamb is taking advantage of his first real chance for a regular starting job in the NBA by scoring at least 18 points in seven of Charlotte’s last eight games. Borrego was hired in May. The former San Antonio assistant felt a backcourt of former Connecticut stars Kemba Walker and Lamb could be “dynamic” in his offense. The 6-foot-4 Lamb came into the league with a reputation as a shooter, but has been improving on getting to the rim and creating shots for himself. Borrego also liked Lamb’s length. The win helped the Hornets erase a bad memory from Sunday night when the Hawks snapped a 10-game losing streak with a 124-123 victory, with John Collins blocking Walker’s shot at the buzzer. Hornets: Malik Monk left in the second half with a quad contusion. 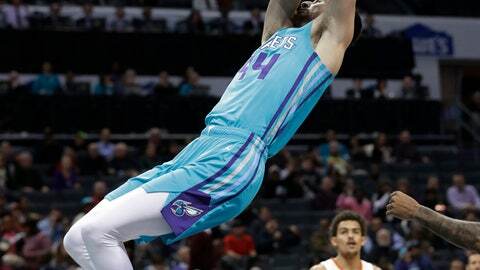 … Frank Kaminsky continued to see extensive minutes off the bench ahead of Willy Hernangomez. Kaminsky finished with eight points on 3-for-9 shooting.